On Episode 31 of the Spybrary Spy Podcast, host Shane Whaley discovers more about Edinburgh Spy Week 2018 with one of the organisers, Professor Penny Fielding. 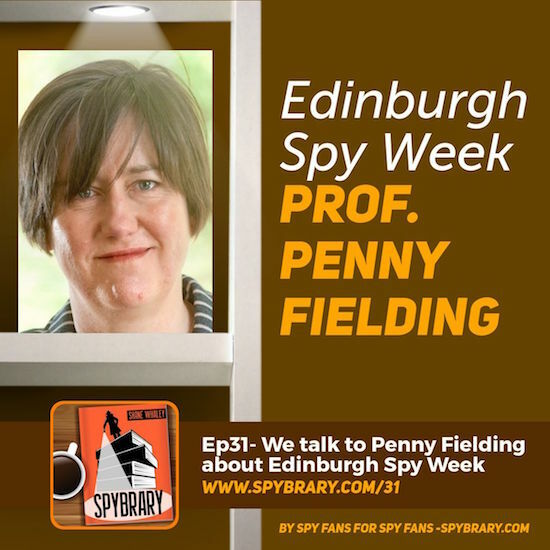 Edinburgh Spy Week 2018 -Professor Fielding makes her debut on Spybrary Spy Podcast to tell us more! Penny reveals a stellar line up of speakers who will be starring at the fifth Edinburgh Spy Week. Can’t make Edinburgh? This interview is still worth listening to you as Shane finds out more about Prof Fielding’s love for spy literature and movies. 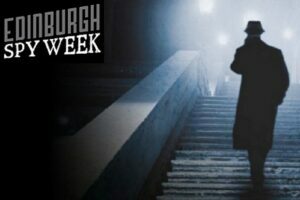 Edinburgh Spy Week is a unique public event that focuses on espionage fiction and film and the ways in which secrecy and spying run through our history and culture. They bring together creative practitioners and academic researchers to talk about books and ideas in public and accessible ways. What exactly is Edinburgh Spy Week 2018?- When is it? – What’s in the programme? – how can people register? Penny shares with us the origins of Edinburgh Spy Week and how it got started. How Professor Fielding become interested in espionage books and movies. 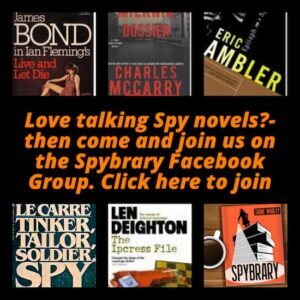 Why is spy fiction so male-dominated (both in authors, and in readership) as opposed to a genre such as mystery? What does Professor Fielding think of the female characters in John Le Carre’s spy novels? Which spy authors does she think portrays female characters credibly? Which spy book does she think has the best written female characters? If Spybrary could arrange for Prof. Fielding to meet John Le Carre over a cup of tea in Cornwall what would she ask him? As an English Literature Professor and the organiser of Edinburgh Spy Week 2018 what does she feel is the gold standard of spy fiction writing? As a fan of Le Carre’s Tinker Tailor Soldier Spy what is her take on the tv adaptation of the novel and the movie version. If she could be a character in a spy book or movie, who would she choose? In a celebration of Spy Week’s 5th Birthday, two of our favourite authors from previous years return to talk about spies in contemporary fiction, television and film. Leading academics discuss wartime Muriel Spark’s work in MI6’s ‘Black Propaganda’ Unit, and how we can read her novels in relation to this. Mark Laity is the Director of Communications at SHAPE, NATO’s Military HQ. As BBC Defence Correspondent, he reported from the frontlines of many wars including the break-up of Yugoslavia and the 1991 Gulf War. Two leading historians and biographers discuss what it means to write about men and women whose profession it is to conceal their identities. How do biographers address the secret lives of spies, and the lives of those who know them? Spy Week ends with a thrilling encounter between a crime writer and an espionage author! Two of Britain’s most acclaimed writers in these genres discuss the differences and similarities between spy and detective fiction. Please Check the Edinburgh Spy Week 2018 for details. Some of the spy books/spy movies we mentioned/reference during this fascinating conversation with Professor Fielding. Please note Spybrary earns a small commission for each Amazon purchase. This helps cover the costs of producing the Spybrary Spy Podcast.